Users accidentally deleting documents, versions of documents, folders, list items, document libraries, or lists from SharePoint farms are some of the nightmares many administrators have to deal with. If this happens with regular Windows Explorer, then users pressing Shift + Del delete the item irrecoverably. SharePoint, however, sends each deleted item to its Recycle Bin, which acts as a kind of safety net for users and admins, allowing them to restore any mistakenly deleted item. 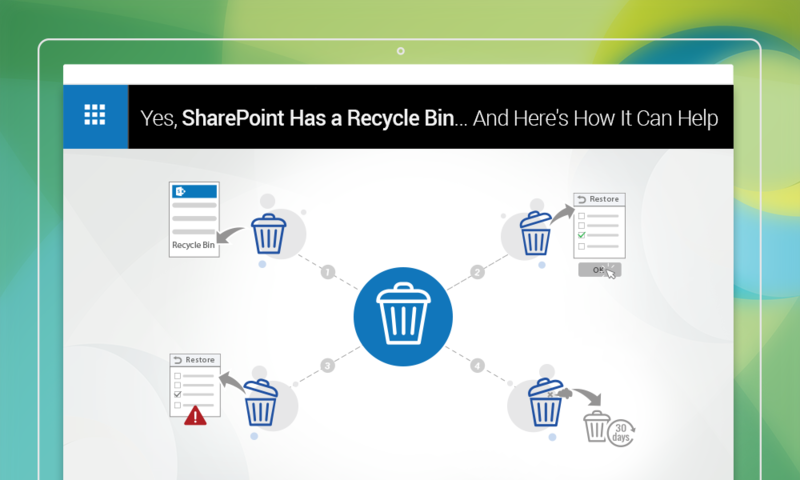 Here’s how a SharePoint administrator can manage the Recycle Bin associated with a site collection. The Recycle Bin is located in the Quick Launch bar, located on the left of the screen. If it is not visible there for some reason, then administrators can locate it by clicking on Settings, and then on Site Content. The Recycle Bin icon will be there at the top right corner of the Site Content page. Restoring accidentally deleted items from the Recycle Bin is simple and hassle free. Every item present in the bin has a checkbox on its left. An admin/user can simply check the boxes beside the items he/she wants to restore, and finally click on OK in the confirmation dialog box. So far, so good. However, there are situations where an admin/user might not be able to restore deleted items from a Recycle Bin, even if the items are clearly visible in the bin. This can happen if the parent of an item has also been deleted. The following are examples of such situations. If a list is deleted after some of the individual list items have been deleted, then those items cannot be individually restored until the list itself is restored. A version of a file cannot be individually restored if the original file has been deleted as well. The file must be restored first, and then its versions. If a library is deleted after some of its contents have been deleted, then the former must be restored first, before any of the contents can be restored. In this case, however, it should be noted that when the library is restored, all of its contents will also be restored automatically. There’s one major exception to this rule though, and it is with folders. When an admin restores an item that was in a folder, after the folder itself has been deleted, the folder is recreated at its original location and the file is restored to that. Other contents (if any) of the folder are not restored, however. On a final note, even if an item is deleted from the Recycle Bin, it can still be restored. In this case, the item is sent to the Site Collection Recycle Bin, where it stays for about 4 weeks, after which it is completely purged from SharePoint. This is extra layer of security that Microsoft has provided, to make sure it is actually quite difficult to delete a file completely from SharePoint. At least for about 4 weeks afterward, admins always have access to a backup plan they can fall back on, should the situation call for it. Proper usage of the Recycle Bin can save admins hours worth of time, not to mention potentially reduce hassles related to missing files. For best results, it makes sense to train every user on its proper usage, as well.